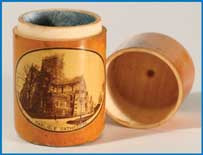 Alex Wilson, the foremost authority on Mauchline box ware will be “in residence” at Dumfries Museum for the day. He will have a selection of examples from his own collection with particular relevance to Dumfries to show. There will also be an opportunity to view Dumfries Museum’s reserve collection of Mauchline box ware.